“What is Gingivitis?” Gambrills patients often ask. It is the early stage of gum disease, a painless infection. Without treatment, gingivitis progresses to full-blown periodontal disease, which can have a serious impact on your appearance, oral health, and whole body wellness. The good news is that gum disease can be prevented, reversed, and managed effectively. Dr. Vickii Bingham-Lester works closely with patients in Gambrills and Crofton, MD and throughout the greater Washington DC area, helping them enjoy the benefits of healthy gums. Bacteria feed on sugars in bits of food debris trapped between teeth and in plaque. As they eat, they excrete toxins that cause gum tissue to pull away from teeth. Gum disease is measured by the attachment of gums to teeth. If four millimeters of gum tissue at the edges is not firmly sealed to teeth, you have gingivitis. The most noticeable symptom is bleeding gums. Gambrills patients can avoid more serious forms of gum disease by seeking treatment promptly. Untreated, the condition progresses into periodontitis, creating pockets of five millimeters or greater. You cannot clean these pockets with brushing and flossing. You may experience chronic bad breath, tooth sensitivity, and decay. Teeth become loose, and eventually fall out or have to be extracted. The best solution for gum disease is prevention through good oral hygiene. However it is never too late to begin treatment. Your first step toward healthy gums is scheduling a consultation. If you have gum disease, your Gambrills dentist will schedule scaling and root planing, which removes plaque and tartar from pockets and smooths tooth roots. It is vital to maintain frequent hygiene recalls, every three to four months. Gum Disease - the 3 stages of gum disease are gingivitis, periodontitis and advanced periodontitis. Gingivitis is caused by toxins irritating the gum line as a result of plaque buildup. Signs and symptoms of gingivitis include swelling, sensitivity and bleeding of the gums during brushing and flossing. Gingivitis can be easily reversed through professional care and good home oral hygiene. 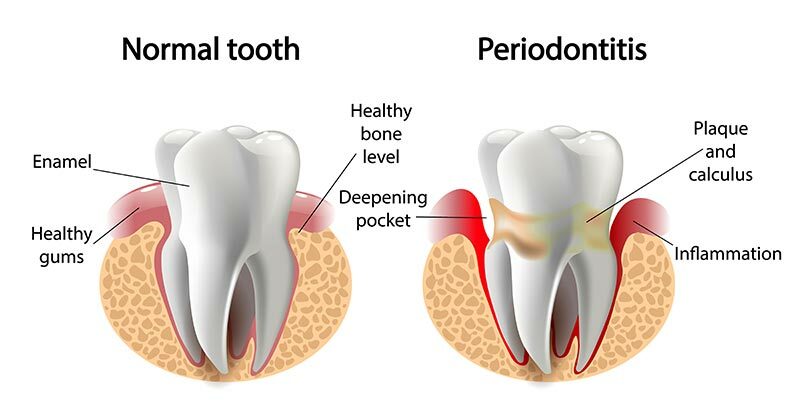 Periodontitis is categorized by irreversible bone loss that results from untreated gingivitis. The gums may begin to form a pocket below the gum line which traps food and plaque. Dental treatment and home care can help prevent from further damage but at this stage, the results are not reversible. Advanced periodontitis is when the fibers and bones supporting the teeth are destroyed. This may cause teeth to shift or loosen. Teeth may have to be removed depending on how enhanced the disease is become and if treatments are not effective. You can begin by preventing gum disease with good oral health. Pick up a brochure or ask your dentist today. Help yourself to understand 'Gum Disease - Types, Symptoms, Causes & Treatments' by watching this instructional video by Bingham-Lester Dentistry. Dr. Bingham-Lester wants you to know that the best solution for gum disease is prevention through good oral hygiene. However, it is never too late to begin treatment. Call her without delay at 410-885-6522. Mary Ellen J "Very pleased with this dentistry , Have been going to this dentistry for about 4 years,and will continue to . So if you are looking for great care please make your next Denist appointment with Bingham-Lester. You will be glad you did..Very satisfied patient.."